Laser vision correction YES or NO? In the past few years, laser vision correction has become increasingly popular method for restoring visual acuity among the population. For it, most often is used Excimer laser, which is applicable to the correction of -13 D myopia, to +5 D farsightedness, astigmatism, provided that the cornea is completely healthy and has sufficient thickness. Today's laser vision correction with this method is completely safe and is applied in adults and children. It is a computer-controlled application of 'flying' laser beams, which are high in frequency range reshaping the cornea and "mildly polishing" it, while changing its refractive power and correcting dioptre. When are laser refractive procedures necessary? Indications for laser vision correction in adults and children are clearly defined, and some of them have motivation to eliminate dependence on glasses or contact lenses, irritation, allergy lens, inability to get vision corrected with prescription with glasses or contact lenses, various professional reasons (engaging in skiing, swimming, diving ...), the sense of not fitting socially, detachment from society because of being vision impaired. Vision in children varies with the growth and maturing, but the procedure follows a normal moments and aims to create the conditions that the child develops a sharp vision. Laser vision correction in children is sometimes applied to pre-schoolers as the only option to reduce vision problems that would occur if the correction is left out. Often laser decreases vision problems, while the rest can be adjusted with glasses. In children such correction is applied in the case of different vision problems on the eyes, the appearance of strabismus (eye turn), or due to inadequately corrected dioptre. In adults the period of development of vision is already completed and nothing can affect the 'structure' of visual acuity if it was not from the earliest days. Dioptre can be corrected completely and then return the vision that existed at the time of the completed development of vision, the seventh-eighth year. So, around which the rest of visual disability after that age - remains visually impaired. How long the laser vision correction lasts in practice? 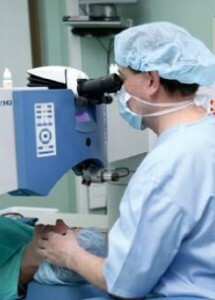 Today, laser vision correction is one of the very fast, precise, effective, predictable and safe interventions that on average takes a few minutes, but the differences in the duration of the procedures there, depends on the height of the dioptre and application of specific procedures in the case of pronounced visual impairment, which maximizes protection of cornea. The procedure is all the time controlled by modern lasers designed for correction of dioptres of exceptional quality and precision in almost every better equipped eye clinic in the world. Anaesthesia is local, actually topical (drops are implemented). Only in young children, people who do not cooperate and patients with psychiatric disorders are applied general anaesthesia. Even with slightly older children laser vision correction can be done under general anaesthesia, if there is fear or inability of cooperation with them. This is possible only when the families prepare the children well, when there is no intimidation, and when it passes through the procedure with a lot of security and support. How long is the recovery after laser vision correction? For recovery to achieve epithelialization of the cornea, it takes a few days. During that time, while having a protective contact lens under which the process takes place epithelisation, patients should avoid light since it acts irritating in the first few days. After you perform laser vision correction, patients can immediately go home, no hospital stay. Most importantly, regular instillation drops following the detailed instructions of doctors. The first day after surgery, these people are more sensitive to light, so it is advisable to avoid bright light, no sun, or strong artificial light. It is advisable to avoid the stuffy and smoky rooms to prevent eye irritation. Laser eye surgery is not applied in the case that the cornea is too thin in relation to the amount of dioptres which is corrected, then there are some risks. For such situations, the method of choice is surgery with implantation of special intraocular lenses, which are also performed under local anaesthesia. Recovery is fast, lasts one day, and the results are excellent. In the case of keratoconus (corneal disorders characterized by changing its shape), laser vision correction can be done, but only in conjunction with the procedure for stopping the change - CXL, but only limited dioptre. Laser vision correction is not performed if there is a dysfunction of the cornea, a systemic disease or immune disease of the eye, as well as for pregnant women and nursing mothers until it has stabilized the hormonal status. Each Committee of two must have known that the cornea acts by biological laws, it is subject to change even in the daily rhythm. In certain situations, the dioptre can be changed independently of the laser vision correction. Therefore, the laser must be understood as an opportunity to correct the dioptre, but no way to stop it in its eventual changes dictated by other bio-mechanism. After the forties of life, when it comes to aging of the lens and loss of accommodation, there is a dioptre for reading, which is not corrected by laser. Millions of patients around the world are satisfied with the results of these procedures, because they are released depending on the prescription glasses and contact lenses, while children create conditions for the formation of a clearer, sharp vision in situations when it does not achieve the desired effect no glasses nor contact lenses are needed. Laser eye surgery solves problems in children because with this method their eyes are properly adjusted lowers the degree of visual impairment and creates conditions for a normal childhood and education. If these timely corrections are absent, the children with these problems would have to attend a special school for children with visual impairments. The experience of the past few years, are excellent when it comes to eye clinic in the world. Laser refractive procedures in children and in adults is done when there is an indication of this. It can be done at a very early age, or in the second or third year, usually in the case of large differences in refractive error, or if dioptre exists only in one eye, which is not common in this age group. If the dioptre is uncorrected in the early, pre-school age, the child will not have the conditions to form a sharp vision up to seven years of age and it cannot be completely corrected with later correction. Dioptre can be corrected later, but low vision to some degree will stay. The laser vision correction in children aims to create conditions for the formation of a sharp and clear vision, and application in older, people just corrects the dioptre, but not 'constructs' vision. Price lists are different depending on the clinic and the institution where the procedure is performed. In average it costs several thousand euros per eye, for more information, we recommend that you visit or call some eye clinics. The middle-aged patients, 40 years of age and older, laser vision correction can be applied to correct distance vision, but not for reading. Therefore, in this population it is better solution an implantation of special intraocular lenses, which will achieve clear and near vision, distance and middle distance.